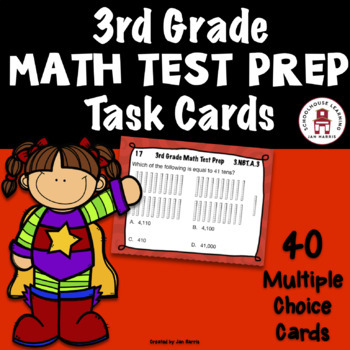 This set of 40 multiple choice task cards are the perfect review before the 3rd grade state assessment. 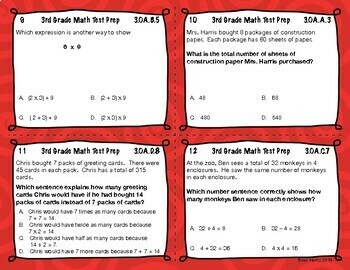 All of the cards are aligned to the common core state standards. You can use these as morning warm-ups a few at a time leading up to the state test or they can also be used as an assessment to decide what topics may require additional review. 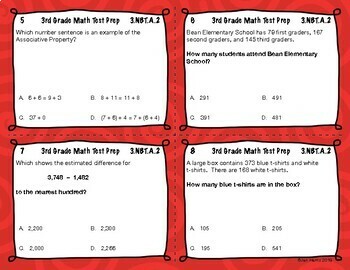 This set of task cards would also benefit 4th graders, as they will also be tested over the 3rd grade standards. Also included you will find an answer key and two different student recording sheets (the first set of recording sheets give students room to show their work and explain their thinking, the second recording sheet just requires students to record the correct answer choice making grading super easy). 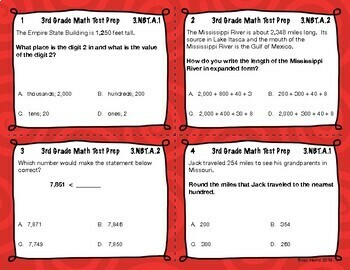 All task cards show the common core standard in the upper right hand corner. Print in color for best results, but will also look fine printed in grayscale. Laminate and use year after year. Please be sure to give feedback on this product and earn TpT points for more great products. Your comments are always welcome and appreciated! Follow me for more great products at great prices! Base Ten Riddles - Who Am I?